Charles I, King of Spain, was elected to the vacancy left by the death of his grandfather, Maximilian. The Holy Roman Empire had its roots in the Carolingian kingdom of the eighth century and since the thirteenth century the right of electing the emperor devolved to select princes. The constitutional election of the emperor was of more recent origin, dating to the Golden Bull of 1356. During the fourteenth century, three rival dynasties-Luxemburg, Habsburg, and the Bavarian Wittelsbach-each claimed rightful holder of the imperial throne, drawing Rome into the conflict and the occasion for the anti-papal of polemics of Marsiglio of Padua and William of Ockam, each of which were fled to the patronage of the Wittelsbach claimant, Ludwig of Bavaria. The Golden Bull established fixed rules for the election of the emperor, excluding both papal intervention and the kingdoms of Austria and Bavaria from the election. It named seven electors, four secular and three ecclesiastical: the archbishoprics of Cologne, Trier, and Mainz, and the secular rulers of Saxony (duke), Brandenburg (margrave), Bohemia (king), and Palatinate of the Rhine (count). The election of Maximilian’s successor was hotly contested. Francis I of France, of the Valois line, was a candidate, as was Henry VIII of England briefly. Rome supported the candidacy of Frederick the Wise of Saxony, one of the electors, believing he would stem the tide of the growing Habsburg family. 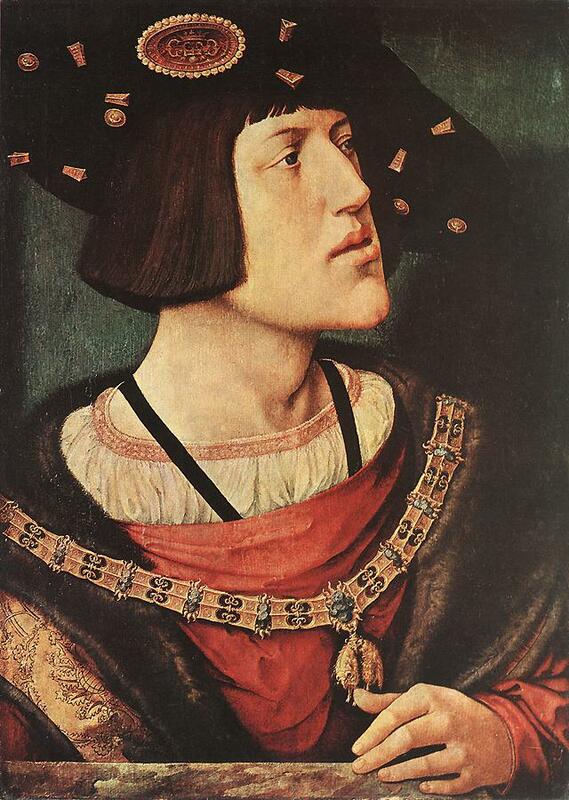 Charles himself was of the Habsburg family, but he was also the maternal grandson of a duchess of Burgundy (Netherlands and northern France) and the maternal grandson of Ferdinand and Isabella, who had united Castille and Aragon into a single Spanish kingdom. Consequently, he was not only the King of Spain, but also inherited Burgundy, Austria, even the Kingdom of Sicily. This made him the natural opponent of Francis I and for fear of Charles’ encroachment on Italy led the pope to side with France against the Habsburg king. However, Charles had the benefit of immense personal wealth, not to mention the backing of the wealthy Fugger bankers of Augsburg, and he was able to purchase the support of the majority of electors to insure his accession to the throne. Enmity between Charles and Rome continued, leading to his eventual sack of the city in 1527 and imprisonment of Pope Clement VII. Charles’ primary goal for the empire was to stave off the advance of the Muslim Turkish forces to the east. However, in order to do that he was forced to deal with the ecclesiastical situation dividing Europe in Luther. His took an active role in attempting to resolve the situation, from offering his own rebuttal to Luther’s famous speech at the Diet of Worms in 1521 to helping negotiate attempted settlements at Augsburg in 1530 and Regensburg in 1541, finally supporting the Catholic kingdoms in military action against Protestant forces in the Schmalkaldic War of 1546-47. Victory there led to the famous Augsburg Interim of 1548, which sought reconciliation of the two religious parties by force. He oversaw the subsequent peace treaty at Westphalia in 1555, which gave the rulers of Western Europe the ius reformandi-the right of reforming their territories and making them Lutheran, or remaining Catholic. Charles finally abdicated his throne in 1556 and retreated to a monastery to study the remainder of his life.